So, you have a great idea for a nonfiction book, but you don’t know a thing about getting it published. Where do you start? What should you send? Are some book publishers better than others? So many questions —but where do you find the answers? The fact is that most budding writers are in the dark when it comes to the publishing world—as are many published authors. How to Publish Your Nonfiction Book was written to provide you with an insider’s knowledge of how publishing companies operate. Now, in response to a rapidly changing industry, author Rudy Shur has revised and updated this complete guide to making the right publisher say yes to your nonfiction book. 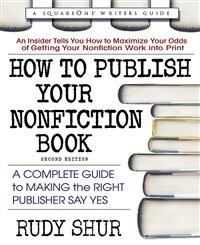 This edition of How to Publish Your Nonfiction Book starts off by helping you define your book’s category, audience, and marketplace so that you know exactly where your book “fits in.” Following this, you are guided in choosing the best publishing companies for your book and in writing a winning submission package. Then the Square One System tells you exactly how to submit your package so that you optimize success while minimizing your time, cost, and effort. Also included is a special section on contracts that will turn legalese into plain English, allowing you to be a savvy player in the publishing game. Most importantly, this book will help you avoid the most common errors that so often prevent writers from reaching their goal. Dreaming of seeing your book in print is easy. Getting it published can take some work. With How to Publish Your Nonfiction Book in hand, you have a proven system of getting your book from the desk drawer to the bookstore.